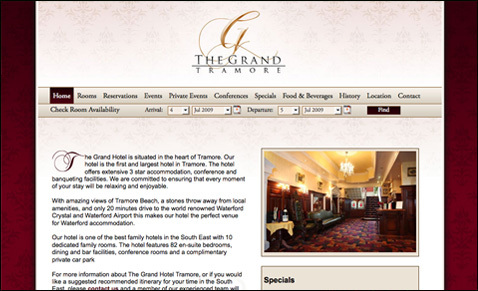 The three-star Grand Hotel in Tramore approached Alpha Design to redesign their website. They wished to improve their online presence and increase their website's traffic. We designed a website for them which is classy and elegant in style, and user-friendly and cleanly laid out. We incorporated their newly designed logo into a central position to gain maximum impact and memorability. It was an essential part of the project that the design would enable changes to more areas of the site, as this was crucial to the continued and improved success of the hotel's website. To this end, we slotted in a Content Management System (CMS) which gave them the facility to login when it suited them, and update or change the content on their website with ease and efficiency. We provided logo development, website design with valid CSS/XHTML and website hosting. For related work, please visit our Graphics Portfolio for more information.